Serbia, University of Belgrade, Faculty of Mechanical Engineering on July 1-2. 2014. 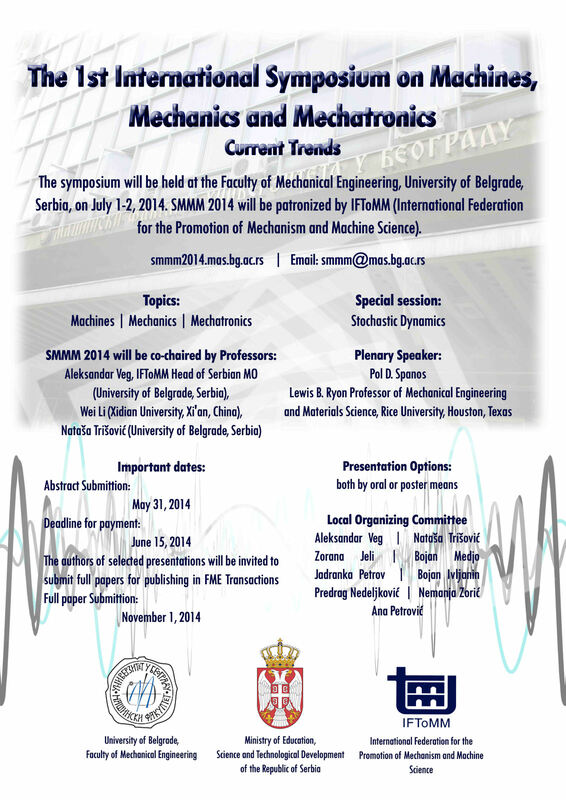 The symposium will be held at the Faculty of Mechanical Engineering, University of Belgrade, Serbia, on July 1-2, 2014. SMMM 2014 will be patronized by IFToMM (International Federation for the Promotion of Mechanism and Machine Science). Symposium will be held for the first time. They will be the editors of the symposium proceedings. Plenary Lecture: “ Traditional and Emerging Techniques for Practical Random Vibrations Analyses"
A one-page abstract of your papers in MS_WORD.doc format (Abstract Instructions) must be submitted by June 13, 2014, at smmm@mas.bg.ac.rs. It will be included in the Conference Abstracts Book which will be provided to the participants during registration. Registration form should be sent by June 13, 2014. Your Power Point Presentation or Poster prepared according to the template (soon) should be sent by June 25, 2014, by e-mail at smmm@mas.bg.ac.rs. Bring printed poster to the Symposium with you. The authors of selected presentations will be invited to submit full papers for publishing in Journal FME Transactions (SCOPUS) after Symposium (December 2014). Your papers, with length not exceeding ten (10) pages, should be submitted by November 1, 2014. at smmm@mas.bg.ac.rs. The instructions for the preparation of your papers are identical to those for the Journal of FME Transactions. Deadline for registration fee payment is June 15, 2014. For information and instructions regarding payment should be written on smmm@mas.bg.ac.rs. The contact person for this aspect of the symposium will be Natasa Trisovic. Book of abstracts, CD media, attendance on all scientific sessions, lunch and refreshments, dinner, sightseeing trip. Pre-review for paper publishing in **FME Transactions**.